The smaller isoform of the enzyme glutamic acid decarboxylase (GAD65) is a major islet autoantigen in autoimmune type 1 diabetes mellitus (T1DM). 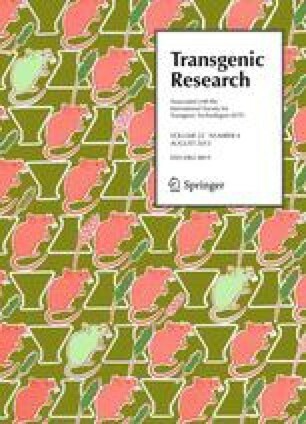 Transgenic plants expressing human GAD65 (hGAD65) are a potential means of direct oral administration of the islet autoantigen in order to induce tolerance and prevent clinical onset of disease. We have previously reported the successful generation of transgenic tobacco and carrot that express immunoreactive, full-length hGAD65. In the present study, we tested the hypothesis that the expression levels of recombinant hGAD65 in transgenic plants can be increased by targeting the enzyme to the plant cell cytosol and by mediating expression through the potato virus X (PVX) vector. By substituting the NH2-terminal region of hGAD65 with a homologous region of rat GAD67, a chimeric GAD671-87/GAD6588-585 molecule was expressed in transgenic tobacco plants. Immunolocalization analysis showed that immunoreactive GAD67/65 was found in the plant cell cytosol. By using a radio-immuno assay with human serum from a GAD65 autoantibody-positive T1DM patient, the highest expression level of the recombinant GAD67/65 protein was estimated to be 0.19% of the total soluble protein, compared to only 0.04% of wild-type hGAD65. Transient expression of wild-type, full-length hGAD65 in N. benthamiana mediated by PVX infection was associated with expression levels of immunoreactive protein as high as 2.2% of total soluble protein. This substantial improvement of the expression of hGAD65 in plants paves the way for immunoprevention studies of oral administration of GAD65-containing transgenic plant material in animal models of spontaneous autoimmune diabetes.